LUMPAC also has a module designed for the calculation of the singlet and triplet excited states of the system organic part (Figure 1). The excited state energies are important for predicting the energy transfer and back-transfer rates between the organic ligands, which act as an antenna, and the lanthanide ion. The lanthanide ion is conveniently replaced by a 3e+ point charge in this calculation. This treatment has been shown to be quite adequate, as can be seen in the following reference . Figure 1. Module designed for the excited states calculation of organic part using the ORCA program. The excited states are calculated by the ORCA program . This program consists of a computational package of modern electronic structure developed by prof. Frank Nesse (Universität Born), and the ORCA development project counts with the contribution of many research groups. The ORCA binary files are freely available for academics. To download them, it is only necessary to create fill a form at the following site: http://cec.mpg.de/forum; no license is needed. When the download ends, you will have in your computer the compacted file, containing around 1.5 gigabytes and more than 30 binary files, which must be extracted to the same directory. LUMPAC runs ORCA using command lines, and to avoid some problems, it is strongly recommended to place the ORCA executable files in a directory with a short name, such as C:\orca_win_exe_3.0. 3. As soon as defined the directory where the ORCA program is located, click on button (Figure 3) to open the MOPAC output file (.out) created by the process of geometry optimization described in Section 1. Figure 3. 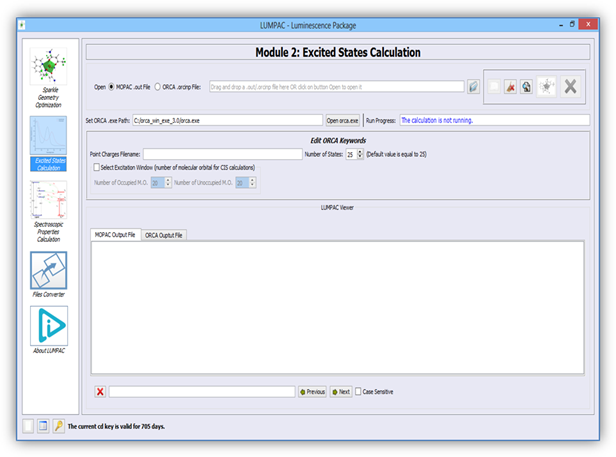 LUMPAC interface showing the different type of files that can be used as input file for the excited states calculation. 4. 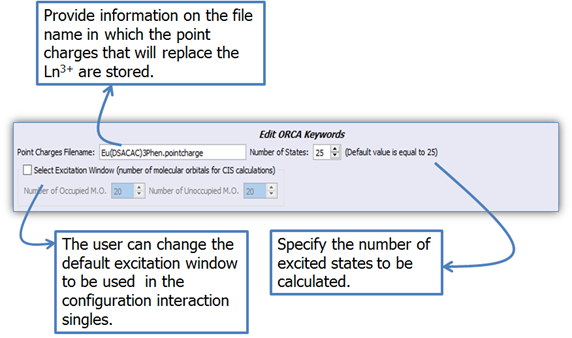 The ORCA keywords (Figure 4) must be adequately specified before carrying out excited states calculation. Define the number of states to be calculated. Optionally, the orbital ranges that will be used in the configuration interaction single (CIS) can be changed. Button (Figure 4) will be activated as soon as the MOPAC output file is loaded. Figure 4. LUMPAC editor of the ORCA keywords. The keywords will be used for carrying out the excited states calculation using ORCA. A wide range of calculations can be performed with ORCA program, from geometry optimizations to spectral parameter calculations, using different levels of theory. Despite all functionality, LUMPAC simply uses ORCA to perform the ligands’ excited states calculation. Therefore, a configuration interaction single (CIS) based on the INDO/S method INDO/S  will be used. The optimized coordinate contained in the MOPAC output file (.out) is used as input file for the CIS calculation. Before LUMPAC runs ORCA, the input file is created with the same name of the MOPAC input file; however the file extension is different (.orcinp); whereas the ORCA output file will have the .orcout file extension. The ORCA input file created for the Eu(DSACAC)3(phen) compound can be seen in Figure 5. Figure 5. .orcinp file created by LUMPAC from the MOPAC output file of the Eu(DSACAC)3(phen) system. This file will be used as an input file for the ORCA program. The number of excited states, nroot, can be seen in the seventh line (Figure 5). The eighth line shows the size of the CI (Configuration Interaction) matrix that will be used in the CIS calculation (Figure 5). As can be seen in Figure 5, the fourteenth line indicates the .pointcharge filename in which the point charges that will replace the lanthanide ion are stored. Therefore, the .orcinp file will only contain the atom coordinates of the organic part. The Eu(DSACAC)3(phen) system presents one Eu3+, consequently, only one point charge will be used (Figure 6). Figure 6. .pointcharge file containing the point charge that will replace the lanthanide ion. Warming: The .pointcharge file will be used to provide the point charge coordinates of its corresponding .orcout whenever the .orcout file is required as an input file. Because of that, the .pointcharge file must be in the same directory and must have the same filename as the corresponding .orcout. The fifteenth line (Figure 5) has the following data sequence: type of coordinates, charge on the system (considering only the organic part), and the system's multiplicity. A multiplicity equals to 1 indicates that all electrons are paired. Because of this, the first line displays the keyword RHF, indicating that a closed-shell calculation will be performed. If the charge on system is wrong, ORCA will notify an error, and the calculation will be terminated. To minimize the risk of errors, LUMPAC creates an input file for ORCA using the same charge used in the process of geometry optimization. As a result, the user must have been always paying attention to the charge of the system, since the geometry optimization step in Module 1. 5. The ORCA output file will have the same name of the .orcinp file, but with a different file extension (*.orcout). 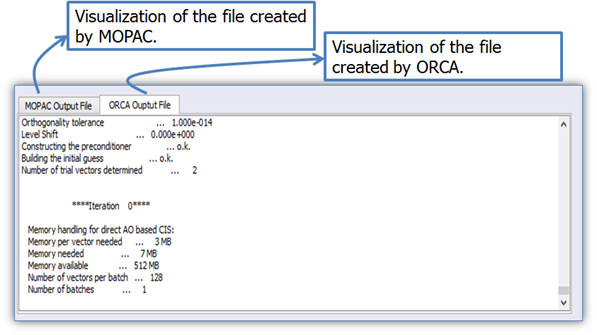 Figure 7 shows the ORCA output file on the LUMPAC file viewer. The ORCA output file can be displayed using LUMPAC text editor (Fig. 8). 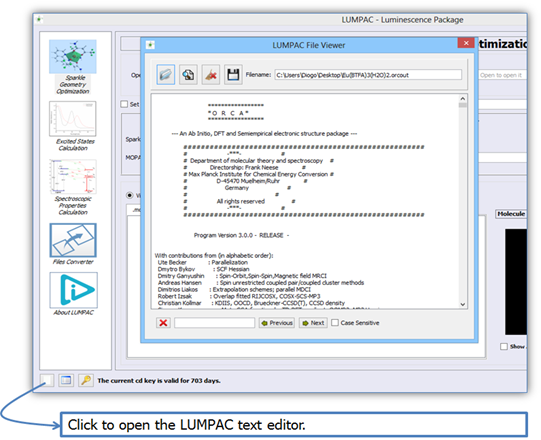 In addition, all another files created by LUMPAC, or by the programs integrated into LUMPAC, can be viewed using this text editor. Figure 7. LUMPAC file viewer showing the input file generated by MOPAC program, and the output file generated by ORCA program. Figure 8. LUMPAC file viewer can be used to view and edit the files created by LUMPAC, or by the programs integrated into LUMPAC. A large number of temporary files will be created in the same input file directory during the calculation. However, LUMPAC will remove them all, as soon as the calculation ends. 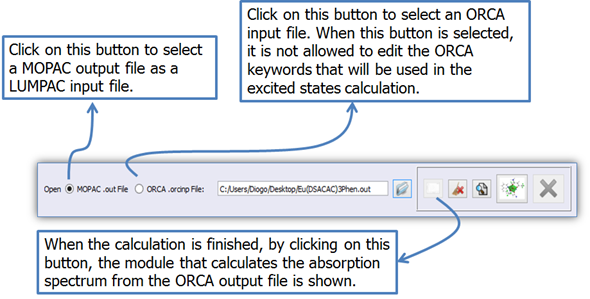 If the user already has an ORCA input file (.orcinp), it is possible for this file to be used to perform an excited states calculation using LUMPAC. Nevertheless, it is not allowed to edit the ORCA keywords using the LUMPAC interface. The .orcinp file can be edited by using a text file editor. To define the orbital ranges (in Eh) used for CIS calculation, the user has to select the option “Select Excitation Window” (Figure 4). When the excitation window is not chosen, LUMPAC will create an input file for ORCA with an excitation window that includes 20 highest occupied molecular orbitals, and the next 20 lowest unoccupied molecular orbitals. This excitation window is thus labeled 20 x 20. The molecular orbital occupancy is identified by examining the OCC column in the Fig. 9. An occupied molecular orbital is defined when OCC is equal to 2.0000, and an unoccupied molecular orbital is defined when OCC is equal to 0.0000. Thereby, the orbital 188 corresponds to the highest occupied molecular orbital (HOMO); whereas the orbital 189 corresponds to the lowest unoccupied molecular orbital (LUMO). Figure 18 shows the section of the ORCA output file containing the orbital energies calculated for the Eu(DSACAC)3(phen) system. Before performing a CIS calculation, the orbital energies are calculated by a SCF (Self-Consistent Field) single point calculation. Figure 9 shows the orbital window used in the CIS calculation, with both the lowest orbital 169 (orbital energy equals to -0.338148 Eh) and the highest orbital 208 (orbital energy equals to 0.052488 Eh) in bold. By examining sixth line on Fig. 5, it is then possible to notice how the orbital ranges were specified. Figure 9. A section of the .orcout output file containing the orbital energies, enabling the selection of orbital ranges to be used in CIS calculation. The excited states are calculated from individual excitations involving the orbitals included in the excitation windows (Figure 10). In another section of the ORCA output file (not shown here), the contribution coefficients of each atom to form the respective molecular orbitals are obtained. Then, parameter RL is calculated by Eq. 19 (Section of Theory), by using these coefficients as well as the distances between the ligand atoms and the lanthanide ion, as will be seen in the Theory of Section. The RL corresponds to the distance from the electronic density donor center (which is located within the organic part) to the lanthanide ion, which functions as the acceptor center of electronic density. A successful calculation will be completed only when the phrase ****ORCA TERMINATED NORMALLY**** appears, as in the figure below. Figure 10. A section of the .orcout file showing the calculated singlet and triplet energies, as well as the individual excitations which form the respective excited states. 1. Santos, J.G., et al., Theoretical Spectroscopic Study of Europium Tris(bipyridine) Cryptates. Journal of Physical Chemistry A, 2012. 116(17): p. 4318-4322. 2. Neese, F., The ORCA program system. Wiley Interdisciplinary Reviews-Computational Molecular Science, 2012. 2(1): p. 73-78. 3. Ridley, J.E. and M.C. Zerner, Triplet-States Via Intermediate Neglect of Differential Overlap - Benzene, Pyridine and Diazines. Theoretica Chimica Acta, 1976. 42(3): p. 223-236.